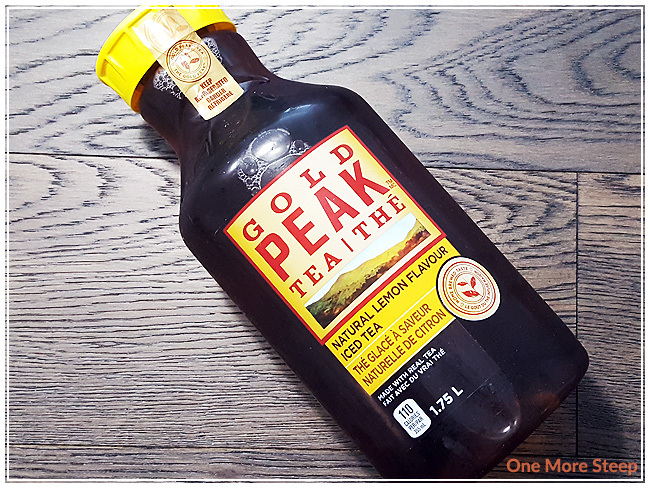 Gold Peak Tea appeared in my local grocery store and I was curious – mostly because it’s a tea product and I’m all about the tea. I was a little bit cautious though, because I can be a bit particular about my teas and a product like this isn’t something that I can play around with to really tweak and modify to my liking. That said, I decided to give their Natural Lemon Flavour Iced Tea a try – mostly because it was on sale. 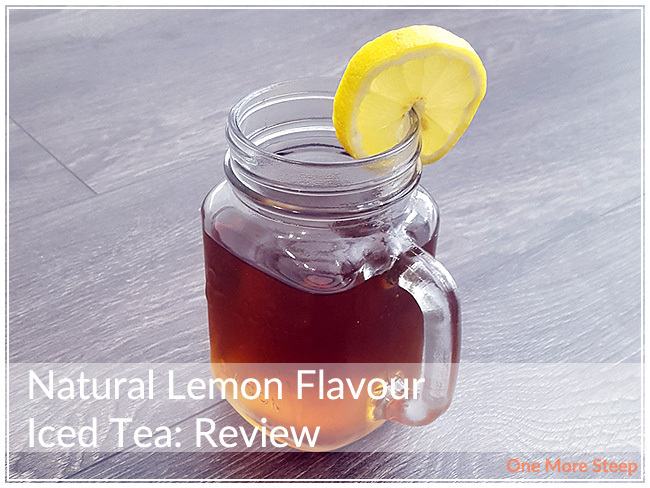 Natural Lemon Flavour Iced Tea is made up of: tea (filtered water, brewed tea concentrate), cane sugar, natural flavour, citric acid, and potassium citrate. Not a terribly long list of ingredients, which is nice to see in a prepared product. As a bonus, the label does mention that this product doesn’t contain preservatives or added colours. Oh, and this iced tea has to be kept refrigerated. Natural Lemon Flavour Iced Tea has a nice colour to it, I can definitely tell that the brewed tea concentrate that they used is a black. The aroma of this tea is all lemon, which isn’t to surprising considering the name of the tea. The lemon flavour is very bright, and the tea itself isn’t as sweet as I expected. The cane sugar has just enough sweetness to cut the lemon to the point where you can taste the lemon and it isn’t making your mouth pucker. The tea base itself has a slight malty flavour to it, which makes me wonder if they used an Assam as the base. It’s smooth going down, and it does well in a pinch if you’re craving some iced tea. I liked Gold Peak Tea’s Natural Lemon Flavour Iced Tea. It’s not too sickeningly sweet, and it’s nice to see a product on the shelf that isn’t full of high fructose corn syrup or artificial sweeteners. I would have liked to have more information about the tea itself on the packaging, although I’m 99% sure that it’s a black tea base in this bottle. I think it’s a great iced tea if you’re looking for something on the go or if you’re not confident in your iced tea steeping skills. The balance of sweetness from the cane sugar to the lemon in this tea are quite good, especially since neither overpower the tea base which I really like. 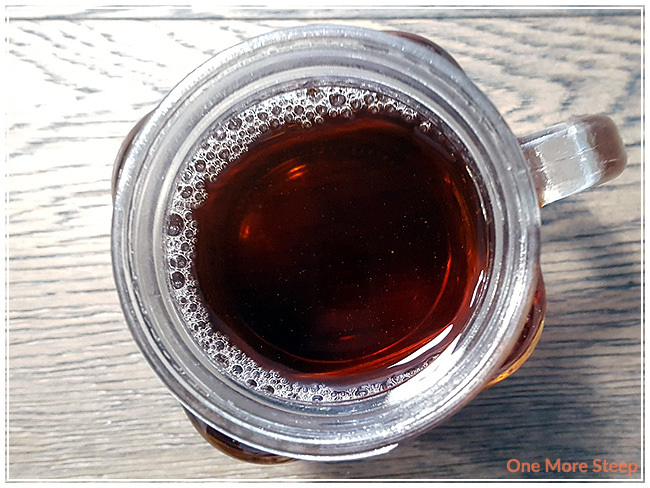 I’m still a huge fan of making my own iced teas at home, I like being able to make a wider variety of iced tea flavours and there’s not a lot of wiggle room in the flavours of this iced tea because it’s a fully prepared product. That said, I think it is delicious. One of the reasons that I probably won’t buy too much of it is because the bottle does take up a lot of real estate in my fridge. If it was shelf-stable and I could keep some in my pantry to save for when I’m feeling lazy, I think that would be a total game changer.